Animals on a "Fun Ride" around the town. 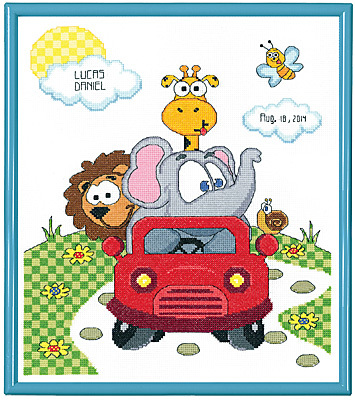 Giraffe, Lion, and Elephant are there to make your birth announcement "Fun". Personalize this counted cross stitch design with your special name and date. Contains: 14-count Aida fabric, 6 strand 100% cotton floss, needle, graph, instructions. Size 11" x 14"